The advent of digital photography has meant that we have much more power over our photographs than we ever did with film. Now we don’t have to wait outside the chemist for our holiday pics, we can see them instantly. The cheap memory cards that store our images have also meant that we take many more pictures than we used to with film. No longer are we restricted to 36 shots, we can take thousands of images and it costs nothing to look at them. Even though modern cameras have all sorts of automatic image modes, pictures can sometimes not be quite what we were expecting. Luckily there’s a solution to this problem. Because digital files can be easily edited, it’s possible to do all sorts to our images that only highly paid professionals used to be able to. Removing faults or adding things to images is much simpler now and with the click of a mouse a picture can be improved. You can’t just sit down at the PC and get perfect results, but with a bit of practice you’ll soon get the hang of things. Before you get too carried away, the first thing to do is backup your originals, so should anything go wrong you can always clean the slate and start again. To start off with you don’t have to do anything too drastic to your images to improve them. A bit of basic cropping can really improve your pictures. Move your subjects around or even cut unwanted people out. Red-eye can be a problem with shots of people, especially indoors where the darkness has increased the chances of the dreaded devil eyes. All you have to do is colour in the red part black. In fact, many photo-editing packages have special modes that can identify red eyes in an image and take them out at the click of a button. More advanced software will allow you to manipulate the brightness and contrast in an image, but remember that the software can’t work miracles, and if the detail isn’t there, no amount of image editing will put it in. The more advanced you get, the more you can do, but always set aside plenty of time to edit your images. It can take lots of effort to get the perfect image and it’s time consuming work. There’s so much you can do to improve or change your images that it can seem daunting at first but if you stick to the basics and move gradually editing becomes much easier. As with everything digital it’s very easy to accidentally delete the data, so make sure you keep regular backups and save originals before working on them. Software can do a great deal to improve your pictures, but remember, it takes hard work to get really good results. 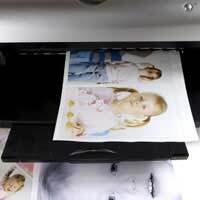 With the right knowledge though you can make your pictures even better and rescue those images that would normally be consigned to the bin.